Another Monday goes in the books. Uneventful for the most part. Yoga, breakfast, work, bike ride, dinner, repeat ad infinitum. Lost a couple of 70's icons again over the weekend in Donna Summer and Robin Gibb. These kinds of deaths always affect me more than those of the "old" stars. They were young when I was young. This, unfortunately, puts me in reach of their fate as well. Not that I wasn't always capable of dying an early death, just that seeing entertainers that I associate with my youth croak, just creeps me out a bit. Don't fret my state of mind, I'm fine actually, it's just an observation of what goes through my head - the noise in my head, so to speak. On the upside, I had a terrific weekend with the family. Friday we all watched the beginning of Rocky III, until the power went out randomly. 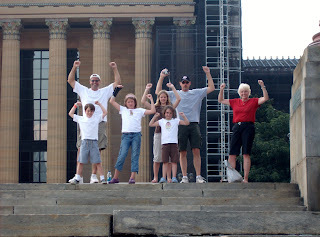 We've been working our way through the Rocky movies, in part because of our visit to Philadelphia in 2008. At that time, we ran the steps to the Art Museum and stood on the spot where they have his footprints bronzed. 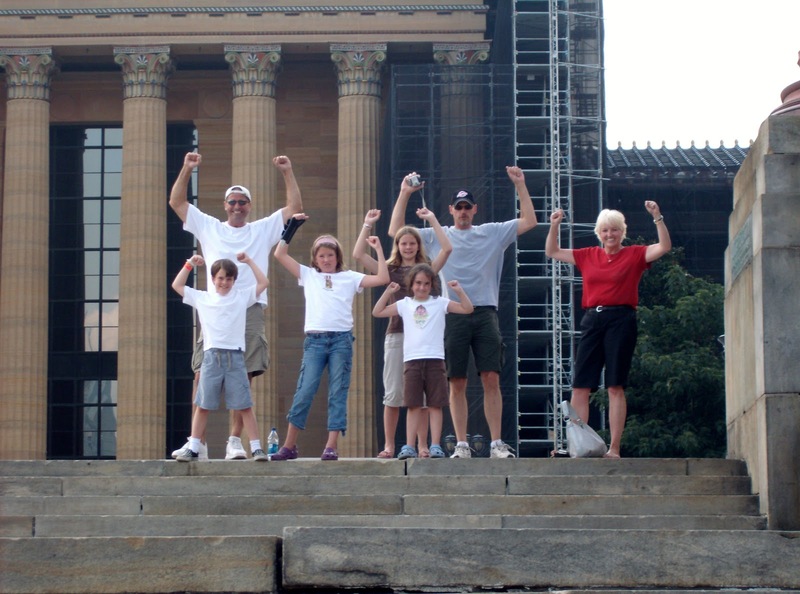 Then, along with Rob's family, we stood for a family picture by the Rocky statue that is at the base of the stairs. What we found interesting was in Rocky III, that actual statue was "dedicated" in the movie, a fact none of us knew. Saturday I had coffee at the Steaming Cup with Donna, one of my favorite things to do on a Saturday. It is a great chance to catch up on what happened through the last week as well as prep for what the day/weekend and coming week will bring. It is her chance to get my undivided attention, a rare thing around our house, as we are always coming or going or trying to shuttle kids here and there. I have your typical man/husband hearing anyways, so I do best when I'm out of the house and can listen just to her, and not be running down my list of things I need to get to. After coffee, I managed to get out kayak fishing for about 3 hours on a nearby lake. I had a blast and some decent success, catching and releasing 7 small Bass, and narrowly missing 3 others. It was an 80+ degree day and cloudless, so conditions could have been better for fishing, but I'm not complaining. I'll take 80 in May any day. It was just good to be on the water. I did see a couple of different boats pulling in big fish, so they are in there, it's just a matter of finding them. I built a Kayak rack for the garage in the afternoon and it came out perfect. Now the thing is up and out of the way in our garage. It only took about an hour to build. Saturday night we spent with our good friends the Barretts as well as my brother(s) in law Mark and Jake. Patty and Brad fed us all with ribs and chicken and we laughed and laughed. We are so incredibly blessed with good friends and family. Our kids have grown up with the Barretts' kids, so they get along very well. It makes it much easier for us to talk as adults while they're off entertaining themselves. It's all good. Sunday we did church and while Donna went to a brunch with some friends, I had the chance to take my kids out to the Steaming Cup, so I did. Again, good one-on-one time with them; a chance to connect unlike I find during our busy weeks. On the way there, in the car, we had a decent talk about some of the things going on in school. Kids with no faith or those who attack Christianity. We also had a frank talk about drugs, bullying and other school issue. I cherish these talks because I know the time is short. It won't be long and I'll be seeing them all off to college. Sunday Night was the last Mosaic gathering of the school year. It was a fun night in the gym and later in the amphitheatre for the Talent Show. Some of these kids have a LOT of talent (and nerve). I'll miss these kids over the summer! So there you have it. In hashing this blog out I have worked through my Monday blahs. When I started writing this, I was determined that my life was groundhog day; the same thing day in, day out. Now that I've laid it all out in writing I realize how REALLY REALLY RICH it is. I tend to get caught in a whirlpool of negativity sometimes and the best way to hash it out is WRITE (sp) HERE.